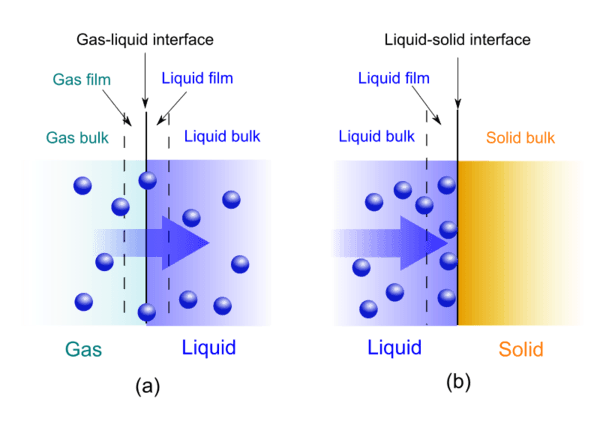 Absorption is the process in which a fluid is dissolved by a liquid or a solid (absorbent). Adsorption is the process in which atoms, ions or molecules from a substance (it could be gas, liquid or dissolved solid) adhere to a surface of the adsorbent. Adsorption is a surface-based process where a film of adsorbate is created on the surface while absorption involves the entire volume of the absorbing substance. Assimilation of molecular species throughout the bulk of the solid or liquid is termed as absorption. Accumulation of the molecular species at the surface rather than in the bulk of the solid or liquid is termed as adsorption. It is a bulk phenomenon It is a surface phenomenon. Adsorption and absorption are both sorption processes. Absorption occurs when atoms pass through or enter a bulky material. During absorption, the molecules are entirely dissolved or diffused in the absorbent to form a solution. Once dissolved, the molecules cannot be separated easily from the absorbent. Adsorption is generally classified into physisorption (weak van der Waals forces) and chemisorption (covalent bonding). It can also be caused by electrostatic attraction. The molecules are held loosely on the surface of the adsorbent and can be easily removed. Absorption: The common commercial uses of absorption cycle are absorption chillers for space cooling applications, ice production, cold storage, turbine inlet cooling. High efficiency operation, environmentally friendly refrigerants, clean-burning fuels and few moving parts that require maintenance make absorption a very good choice for consumers. The process of gas absorption by a liquid is used in hydrogenation of oils and carbonation of beverages. Adsorption: Some of the industrial applications for adsorption are air-conditioning, adsorption chillers, synthetic resin and water purification. An adsorption chiller does not require moving parts and hence is quiet. In pharmaceutical industry applications, adsorption is used as a means to prolong neurological exposure to specific drugs or parts thereof. Adsorption of molecules onto polymer surfaces is used in various applications such as in the development of non-stick coatings and in various biomedical devices. The following video illustrates the differences and some common applications of adsorption and absorption. Contact Equilibrium Processes - The New Zealand Institute of Food Science & Technology Inc.